On March 19th exhibitors arrived from as far away as Florida, Pennsylvania and Canada with great enthusiasm for competing in the thirteenth Cactus Reining Classic at West World in Scottsdale Arizona. When it comes to winter weather, Scottsdale is the place to be. 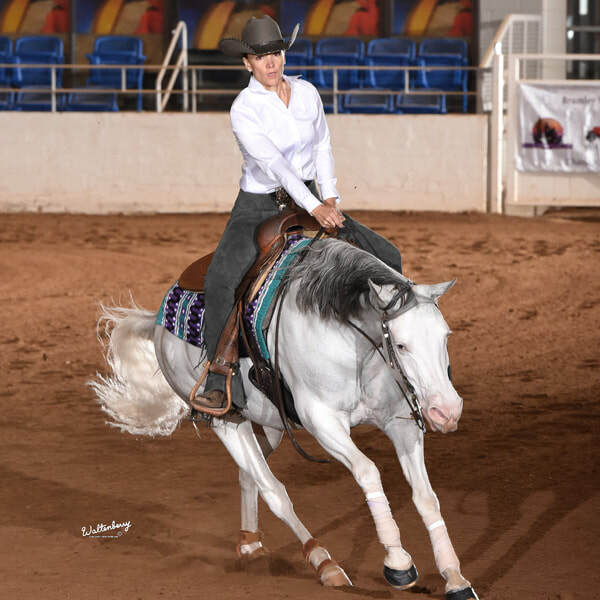 Warm days and cool nights are just what a great horse show such as the Cactus Reining Classic hopes for and that’s what was ordered up for this year’s event. Several hundred talented competitors made the trip to this fabulous city and experienced the first of five Brumley Management Group, LLC’s events in 2018. This year’s event setting did not disappoint. Over $150,000 in cash and prizes was offered and with it brought a significant increase in attendance. The competition began with the Ancillary Open and Non Pro slates. A fixture of BMG Events are the coveted High Point awards. Based on the riders placings in each slate determines the Champion and Reserve Champion High Point winners. Loren Booth from Orange Cove, California rode her mare Taris Little Gunner, a 2011 mare, by Gunner and out of Taris Modern Design, to win High Point Champion in the Non Pro, Intermediate Non Pro and Prime Time Non Pro divisions. “Loren was super consistent with the mare”, comments Tracer Gilson her trainer. The two have really come together in the last year. 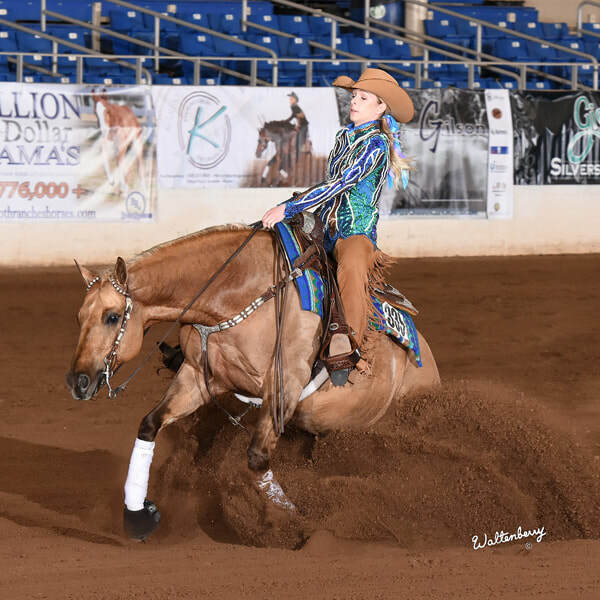 She won the Select Amateur Circuit at the Sun Country show last month and was a finalist at the AQHA Select World in 2017”. Rick Christen’s mare Msdreamy, (Magnum Chic Dream x A Gal With A Gun), won the Open High Point Championship with rider Dan Huss. Whizen Big Chex, (Big Chex To Cash x Whizgun) won both the Intermediate and Limited Open High Point Championship with rider Gary Roberts for owner Kimberly Laser. The Reserve High Point Intermediate Open Championship was awarded to the 2010 gelding Holier Then Thou (Jacs Electric Spark x Slide Me Again) owned by Nicole McDevitt of Woodside, California and ridden by Eric LaPorte. Consistently the largest Ancillary divisions entered at BMG events are the Limited Non Pro and Rookie divisions. “I love to see large entry numbers in these divisions as these are the exhibitors buying the older horses, lengthening their careers and strengthening our industry as a whole,” notes Brumley. “We look to reward these large classes by offering custom High Point Champion trophy saddles. The competition to win these saddles is fierce. Those who win them have definitely worked and showed their tails off.” Winner of the Limited Non Pro High Point Championship and taking home the Silver Spurs Saddle sponsored by Scottsdale Western World was Katherine Dazendorf and her horse Olenas Bright Star, (Starlights Starbright x Olenas Frecklemint). Rookie Level 2 and Prime Time Rookie High Point Champion, Carla Odetto riding Wimpchester 73, (Wimpys Little Step x Whiz N Darlin). Rookie Level 1 High Point Champion went to Ava Bush and Shes A Shining Gun, (Hes A Loaded Gun x Lil Shining Suzana) and the Desert Reining Horse Association (DRHA) Rookie High Point Championship Bob’s Custom Saddles trophy saddle was awarded to Quanahs Last Alex, (Alexander Pep x Quanah Dawn Doc) owner/rider Desiree Hardin. The Youth divisions witnessed an increase this year with 70 overall entries. The youth riders marked some impressive scores for these young Reiners. Ava Bush once again entered the winners circle on Shes A Shining Gun, (Hes A Loaded Gun x Lil Shining Suzanna) winning the Youth 13 & Under High Point Championship and Reagan Vokoun riding Dunitwithashinyface, (Pale Face Dunnit x Shine On Tejon) took the Reserve High Point. Jennifer Neudorf showed her strength for consistency winning the first slate of Youth 14-18 and took reserve in the second slate aboard her horse Blue Collar Tag, (Whiz N Tag Chex x Kachina Oak Olena). Neudorf’s efforts awarded her High Point Champion. Shelby Clausen and Xtra Voodoo Pal, (Shiners Voodoo Dr x Wimpys New Pal) gave Neudorf a run for her money narrowly missing the championship by 1.5 points. However Clausen still took home the High Point Reserve Championship custom trophy buckle. 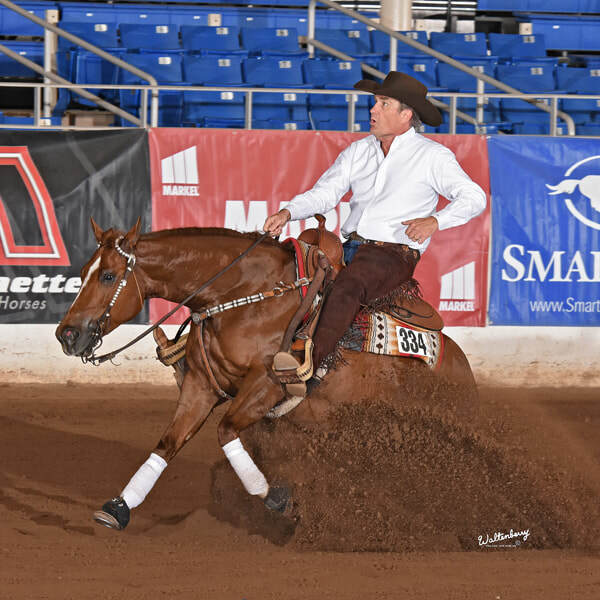 The growth and popularity of the SmartPak Maturity divisions proved evident at this year’s Cactus Reining Classic. Forty seven exhibitors competed and the performances were impressive. After the dust settled on the last rider, Chandler Winard with her score of 220 on her eight year old gelding Tags Golden Star (Whiz N Tag Chex x Boogies Smart Star) to win the Level 2, 3 and 4 divisions, three Gist custom trophy buckles and a check for $1,489.29. Megan Dante aboard her flashy bay gelding Lookies Gotta Gun (Spooks Gotta Gun x Lookie Lu) marked a 219 to win the Level 1 and took reserve in Levels 2, 3 and 4. 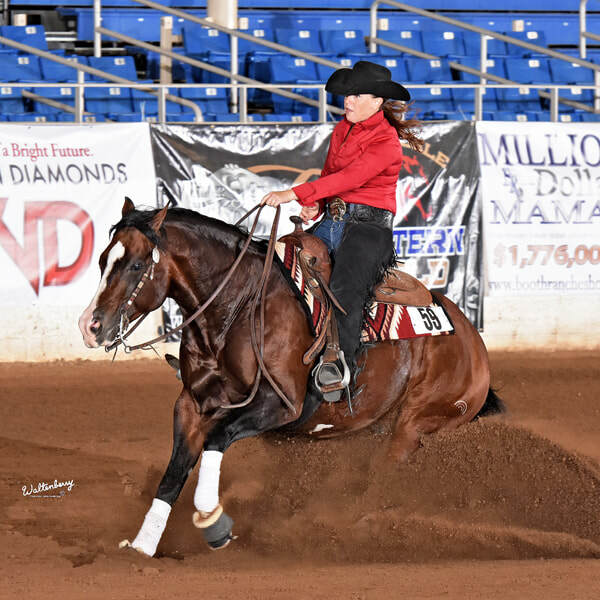 While Cady Shaw, a California native, showed off her talented horse Dream Whiz Me, (Magnum Chic Dream x Whiz Out Chex) to win the Prime Time division while placing second in the Level 1, and third in Levels 2, 3 and 4 claiming her piece of the pie, a check for $1,496.95. The Arabians also enjoyed success in the Maturity. A Maturity is designated as a competition for horses seven years of age and older, while for the Arabians and Half Arabians it is six years of age and older. Michelle Betten took the championship aboard SH Imvaguelysurprised winning $585 while Cotton McNutt claimed the reserve with her pretty grey mare Wheres Wanda RA and a check for $455. The days were long, but the competition just kept getting better. The Non Pro Derby presented a big jump in entries over 2017. With $42,000 in added money no one was holding back. 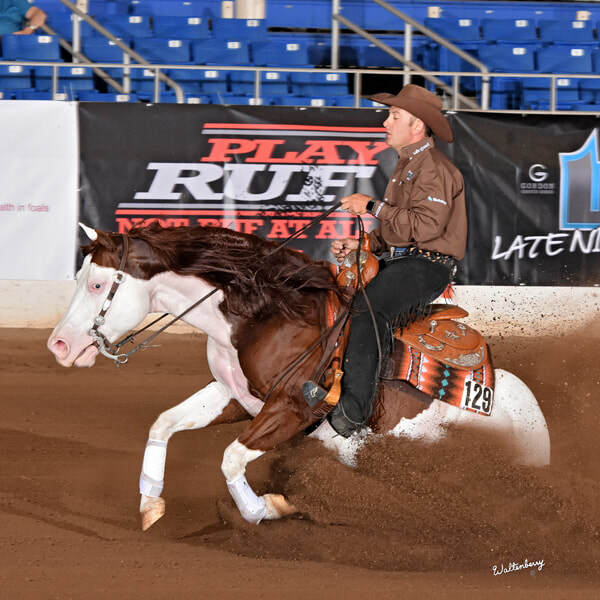 Mark Blake, riding Hot Hollywood Whizky (Topsail Whiz x Hot Hollywood Jewels) laid down a score of 220.5 to win his first Cactus Reining Classic Derby claiming Levels 1,3,4, Prime Time and Masters Derby Championships and a paycheck of $15,009.09. A huge win for Blake! A consistent face in the winner’s circle, Rick Christen gave Blake a run for his money marking a 219.5 on Xtra Voodoo Step (Wimpys Little Step x Voodoo Chic) winning reserve in the Level 3, 4, Prime Time and Masters, taking home a check for $7,755.44. Winner of the Level 2 Non Pro Derby was Kylie Warn riding Lenas Shining Gun (Gunners Special Nite x SL Lenas Chick). The week’s competition culminated in the highly anticipated $70,000 Added Open Derby that brought the ‘big guns’ out to play. Seventy two horses were lined up to compete. Andrea Fappani riding Ifwhizswereguns (Spooks Gotta Gun x Ifwhizsweredollars) for owner Rancho Oso Rio, wasn’t going to let being draw three deter him. With the ‘Fappani style’ determination Ifwhizswereguns marked a 229.5 while the exuberant crowd whistled and cheered. The electricity and anticipation of what was coming next was giving everyone watching goosebumps. Draw twelve, Martin Muehlsteatter aboard his wife Kim’s horse, Spooks Grand Slam (Spooks Gotta Whiz x Shiney Diamond Lady) knocked Fappani right off his lead by marking an outstanding 231. Spectators thought they had witnessed the winning run. The high scores kept coming, Marco Ricotta marked a 228.5 on his wife Jenny’s homebred mare Miss Whizzletown (Hollywoodtinseltown x Rewind N Whiz). To be in the top ten scores it took a 224.5. At draw 65 Muehlsteatter was still holding onto his lead. Then, once again Andrea Fappani entered the arena. This time on his third and last entry draw 66, the stunning five year old stallion Epic Titan (Colonels Smoking Gun x Princess In Diamonds) owned by Clinton Anderson from Stephensville Texas. Avid Reining fans know Fappani will keep trying to outperform others and himself all the way down to his last draw. Once more Fappani walked calm, cool and collected into the arena, started his pattern and after the first set of plus 1.5 spins the crowd knew they were watching something special. ‘The Score’… 233.5 Epic! For complete results and to watch the video of Epic Titan go to www.CactusReiningClassic.com/results.